Below you can find information about our recent Spring Concert, plus our upcoming events: Memorial Day Ceremonies, Senior Awards Night, and Graduation. Applications for Tri-M are due June 3. Also, please mark your calendars (June 14 at 6:30 pm in the school library) for the year’s final meetings of the Mohawk Music Association. The MMA will be electing officers for next year. Please be involved! Spring Concert video is online! Thank you to everyone who came out to our Spring Concert on May 10! It was a night to be remembered. If you missed it, or if you want to see it again, now you can! Falls Cable has posted video of the concert on their website. DVDs of the performance are also available from Falls Cable for $10. This was a very special night. Feel free to share the video with friends and family near and far. Thank you Falls Cable! The High School Marching Band will be performing in parades and services in Ashfield (10am) and Plainfield (1pm). Our students play an important role in these meaningful public ceremonies. Ceremonies will take place rain or shine. More information for about High School Band’s participation in Memorial Day activities is available on my class pages. High School Concert Band will provide processional music to honor the graduating class. Note that the start time is 6:00pm. This is a change from last year. High School Concert Band and members of the Middle School Concert Band will provide processional and recessional music. The High School Chorus and members of Rock Band class will also perform. 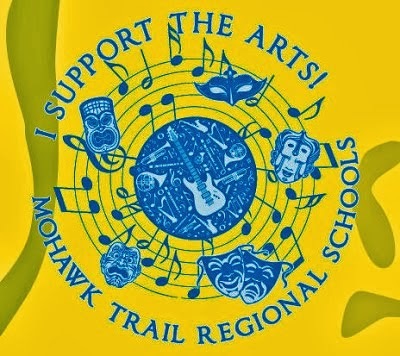 Middle and High School music students will perform at elementary schools to connect with the junior members of our Mohawk community. Is your student interested in joining Tri-M? Mohawk’s Chapter of Tri-M Music Honor Society is accepting new members! Tri-M is the international music honor society for high school students. It is designed to recognize students for their academic and musical achievements, reward them for their accomplishments and service activities, and to inspire other students to excel in music and leadership. Through more than 5,500 chartered chapters, Tri-M has helped thousands of young people provide years of service through music in schools throughout the world. Tri-M is a program of the National Association for Music Education. Students in grades 9-11 who are enrolled in music are eligible for membership. To apply, students write a short essay stating why they would like to join the organization and what special skills and attributes they have to contribute. Mohawk Music Association – Please attend! Here is the date and agenda for final MMA meeting of the year. Please attend and contribute to this important group! Election of officers, schedule the summer potluck meeting. Saturday, May 21st we (PVSYO) will be holding youth orchestra auditions for all young instrumentalists ages 18 and under, at Artspace Community Arts Center, 15 Mill Street, Greenfield, from 10am to 12pm. The cost for auditioning is $20, and online registration is now open. We encourage everyone who's interested to audition, but if young musicians you know don't feel ready to attempt an audition, there's a chance for them to get some practice and some extra coaching at the Summer Orchestra Intensive at Artspace from July 25 - 29. There will be another opportunity to audition in August, date and time TBD. Please feel free to forward this email to anyone you know who might be interested! As in past seasons, the youth orchestra will perform 2 concerts, do at least one side-by-side performance with the PVS Orchestra, and have other opportunities to perform in the community. Rehearsals are Saturday afternoons from 2:30 - 4:30 at Greenfield High School, and run from September through May. If you have any questions about the youth orchestra, email youth orchestra co-manager Cecilia Berger. Thank you for helping us spread the word about the PVS Youth Orchestra auditions!